Interview: Stephen Holmes, partner and practice BIM manager at Foster & partners, on the road to BIM at the UK’s largest and highest-earning practice. How embedded is BIM at Foster + Partners? BIM is totally embedded within the practice, with involvement in its evolution across all our teams and all levels. We have more than 40 BIM coordinators and specialists, as well as BIM working groups with representatives of all our internal teams, in a continual evolution process. On completed BIM projects, have you realised efficiency benefits that are to come in the future? Most of the efficiencies are realised in the downstream process. As a business we have been delivering design using a BIM process for 20 years, so for us it is the norm and benchmarking is difficult to quantify. This is particularly the case if we are only commissioned for 50% service and handing over to a local architect somewhere in the world for later design stages. In these cases, we do not always reap the benefits of the front-loaded development process. Our real measure of efficiency is in our ability to share data and re-use model information for multiple purposes. Though this is often hampered by interoperability issues between software technologies. What key benefits is the practice getting from utilising BIM? Apart from the obvious ones, such as improved design communication and coordination, we are also integrating our internal design “eco system” – from environmental analysis and visualisation, to 3D printing, quantification and construction sequencing. What practical issues have arisen from the the adoption of BIM? Scale of change in a large practice such as ours is always a challenge. With 900 architects and engineers, transitioning them all into a new process and learning new technologies is always time consuming. The large-scale infrastructure projects which we work on have exposed limitations in all of the major BIM technologies out there. Interoperability between applications is still a major challenge for us. 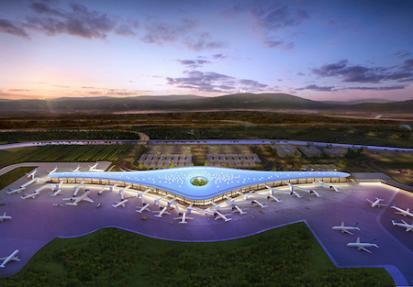 An aerial view of the construction of Tocumen Airport in Panama, which Foster + Partners has designed using BIM (Photo: Rodrigo Guerrero). Where are the unexploited areas of BIM? As the wider industry adopts a BIM process across the complete supply chain we see future advantages in direct fabrication from BIM models. Also, with owner-occupiers becoming BIM aware, there is the possibility of future growth for BIM in facilities management. Do you think that, as a profession, architects are embracing BIM? Most companies are waking up to the fact that BIM is here to stay. Europe and the US are well ahead of the curve. However, China, India, the Far East and South America are still in their infancy, but I suspect they will catch up quickly. Are your clients asking for BIM to be utilised? Yes, this is starting to grow as an increasing trend, but it has really only accelerated in the last two years. How has BIM changed the relationship with main contractors? It has put more demands on the design consultants from the main contractors. Most of the large-scale contractors we work with are BIM capable and it is becoming the expected norm to deliver construction phases using a BIM process. What is the next step on Foster + Partners BIM journey? Evolving our integrated process further, both in-house and with our external design partners, as well as moving into Level 3 BIM over the coming years as our industry evolves, while pushing our software partners to develop their technologies further to suit design BIM. We are also starting work on what Foster + Partners BIM would look like with the new international BIM standards that are being developed at the moment. Si te gusta ¡¡ síguenos ! !